I caught a performance of three piano trios yesterday afternoon, Beethoven’s Op. 1 no. 2, Shostakovich’s No. 2 in E minor, and Schumann’s No. 2 in F major. The highlight of the program (for me, anyway) was the Shostakovich. After the energetic playing of the Aeolus Quartet last week, this trio sounded more restrained; I was worried at the start of the Shostakovich that it was going to be more genteel a performance than I like. (The last one I heard live was the Claremont Trio either May 2014 or the previous May – it is sad that I cannot remember when that was – and it was pretty great; not genteel in the slightest.) This apprehension of mine continued into the second movement, but by the end of that, it was sounding a little more wild and crazy and Shostakovich-like. The best part, though, was the final movement. The pianist used the (what is it called – sustaining pedal? the one that holds the note) early in the movement, and the tempo was slower than I am used to, so that the notes of the piano part rang and lingered in one’s head; it was very distinctive. Very soon I was in total immersion mode. I don’t think I’ve ever enjoyed the finale of that piece quite as much – that feeling of being physically pressed by the music, such that you don’t want it to end. I never realized how much was in that last movement before. And I have taken a gamble. I know that I will have jury duty sometime in the latter end of August. Nevertheless, I have tickets for two concerts during that time. I am betting that 1) I will not get picked to be on a jury or 2) operations will end soon enough each day that I can get from the Queens courthouse to Alice Tully in time. The orchestra for the Beethoven concerto was smaller, and although I could hear both piano and orchestra just fine, I wanted to be a little closer to the stage – especially during the finale. None of the details got lost, but the edges of the notes were softened: I felt like I was hearing more reverb or resonance than I might have if seated closer in and lower down. This is not necessarily a bad thing. During the first movement of the Shostakovich, I noticed that softening effect meant that, for example, all the violins tended to blend together – you really get a sense that the sound produced by tens of violins from a large distance is a completely different animal than one violin right up close. But anyway. Distance or not, I was very absorbed in Uchida’s Beethoven. It was one of those performances where you reach the end and you realize just how deeply you’ve been sucked into it. Even from the way back of the balcony, the cadenza of the first movement, and the shape of the relatively short second movement – this is some serious piano playing. With the Shostakovich symphony I definitely did not need to be any closer than I was. This piece can be and in this case was blindingly intense, and one thing I do like about large concert halls like this one is the sheer range of sound. The finale of this symphony is huge, but in the movement just preceding it, the largo, you can hear even the softest of the violin bits. The contrast in scale is amazing. (Also, hearing a big symphony orchestra from far above is pretty neat – during the first movement, I was listening with my eyes closed, and the contrast between all the strings, and then all the winds, is much greater than you get a sense of on recordings, and you can hear where everything is on the stage very sharply.) I haven’t heard this piece enough times to say that I have absorbed it, but it’s interesting how you can tell when the people performing it have. There is a quality to a well thought out interpretation that you can hear even if you don’t know the piece itself well enough to pick out what makes the interpretation distinct from others. As with the Beethoven, it was only when we got to the end of it that I found myself thinking about how much sense it made. The midterm exam was drawn up under the influence of Shostakovich’s string quartet number eight, performed by the Kronos Quartet. Their version of it that I have is on a CD with an arrangement of a Thomas Tallis piece, a few twentieth century items, and at the very beginning a piece by George Crumb that starts out with a section called “Night of the Electric Insects” that freaked the ever-loving hell out of me the first time I heard it. Last night was Schostakovich’s Lady Macbeth of Mtsensk at the Bolshoi. I have never seen this opera before, and this performance was a decent introduction to it. Also, there were English supertitles! I wasn’t sure whether to expect these or not, and it was a pleasant surprise. 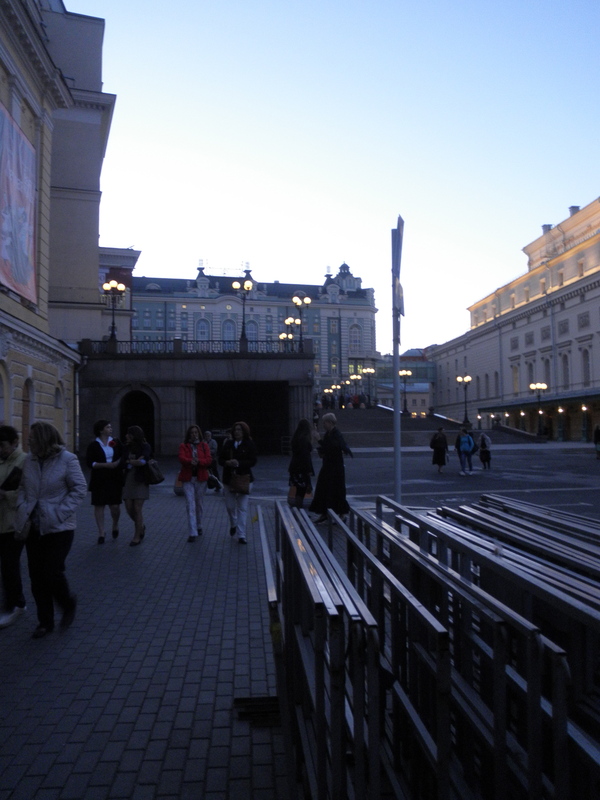 The performance was not in the Bolshoi’s main theater – a certain amount of confusion over this point led to a dash around a police barricade (there was some big shot attending the other performance, I guess) and over to the other theater and through the metal detectors and into the theater and to our seats just in time.